Rosemary plant is an attractive evergreen shrub with needle-like leaves and brilliant blue flowers. Rosemary plants are also commonly used as ornamental plantings in the landscape. The flower part will probably never happen on our rosemary plant but this beautiful herb is noble not because of its aesthetics but because of its sublime fragrance for seasoning meat, especially lamb and beef. 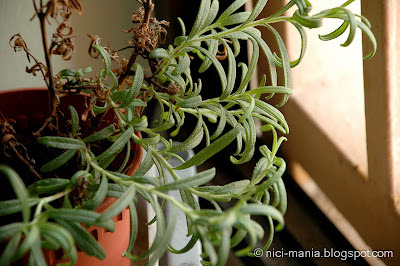 Growing rosemary plants is a simple gardening chore, they do not need much care. 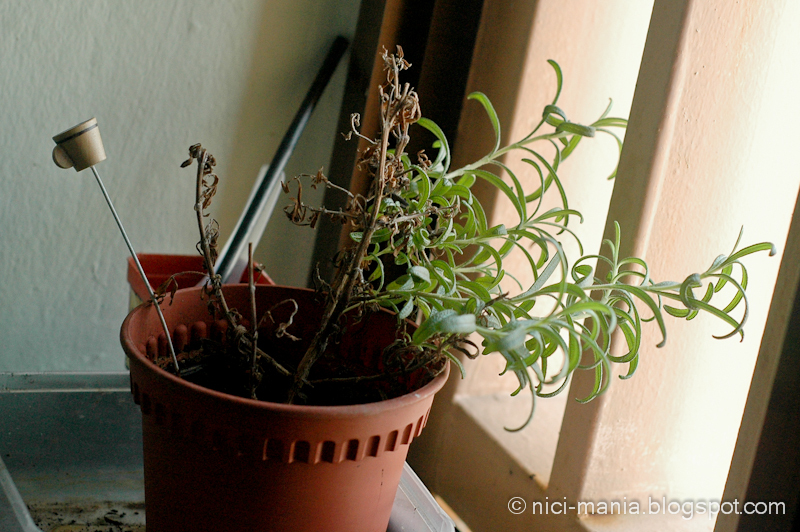 Rosemary plant can simply rely on the strong humid weather to survive, which is one of the specialty for countries here near the equator but apparently our rosemary doesn't exactly like the hot weather here. 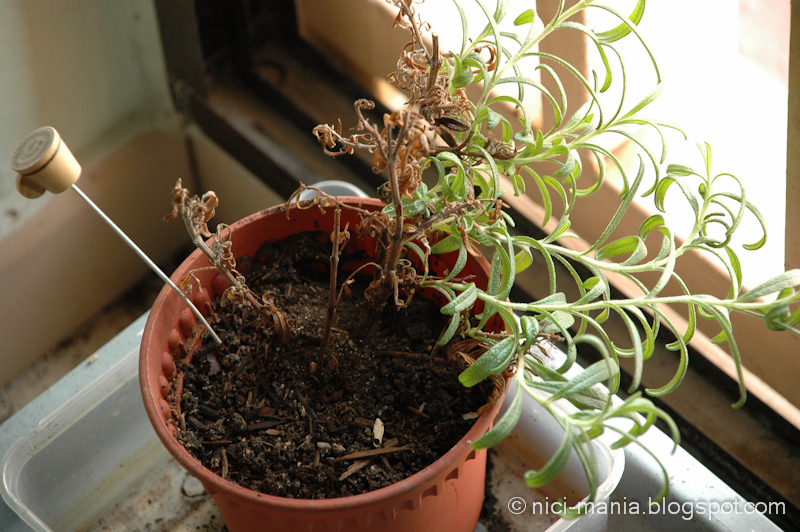 A few months ago, our rosemary plant almost died while we were cooking beef stew (dying rosemary plant picture here) but it somehow miraculously revived itself. 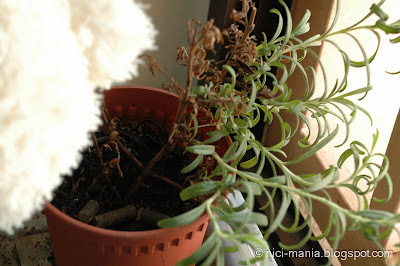 Strange as it may be, but we are not going to debate why our rosemary plant is still alive. The consistent rainy days in the past couple of months could be the main reason giving our rosemary plant enough humid and moisture. Not until recently the weather is going through some drought period with extremely high temperatures which is not a good sign for our rosemary plant but we'll see how it grows. 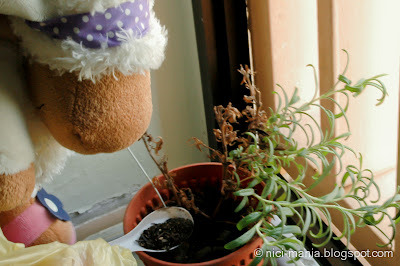 Growing rosemary plants indoors is a big challenge as every rosemary plant loves sunlight, that is why you see our rosemary decided to start growing in another direction which is towards the sun. We are by all means no expert in growing rosemary plants but Jolly Liselle here is going to show you NICI-mania's Rosemary Plant Care 101. 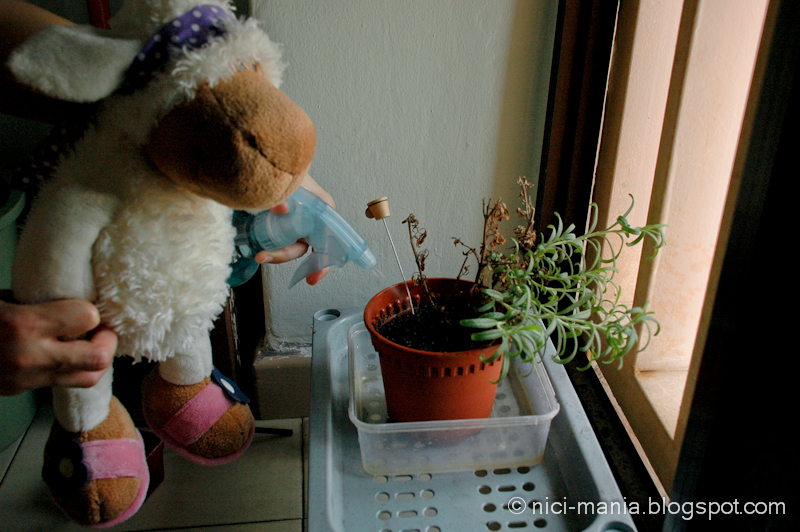 Jolly Liselle is now spraying some midst to the rosemary plant. 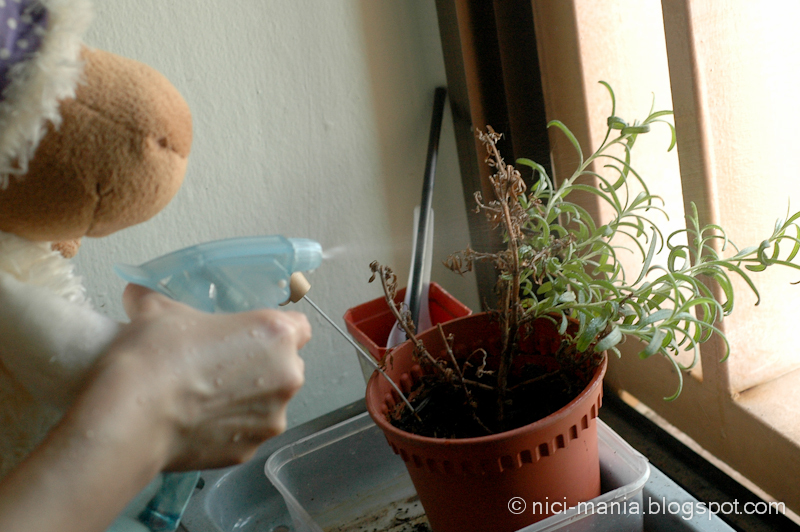 Using a spray bottle ensures that we do not over-water as rosemary plant unlike basil, don't like to be flooded. Carefully spray a few times. 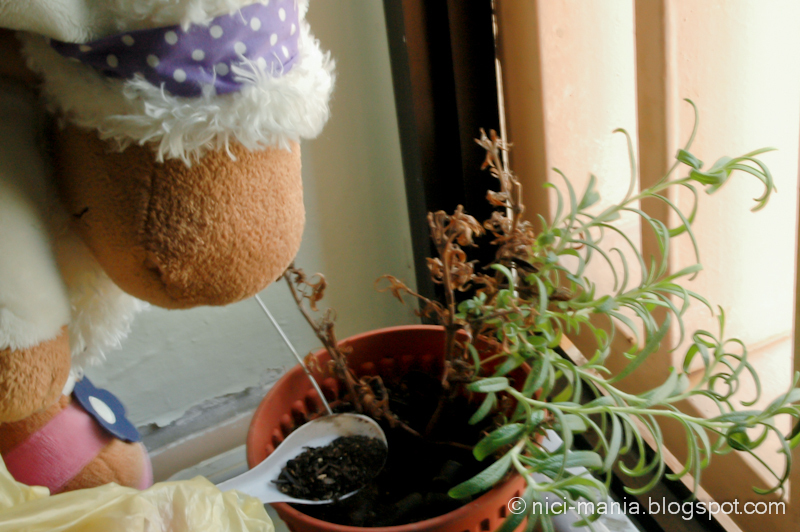 Organic sheep fertilizers are most recommended for growing plants that we eat, in this case the rosemary. 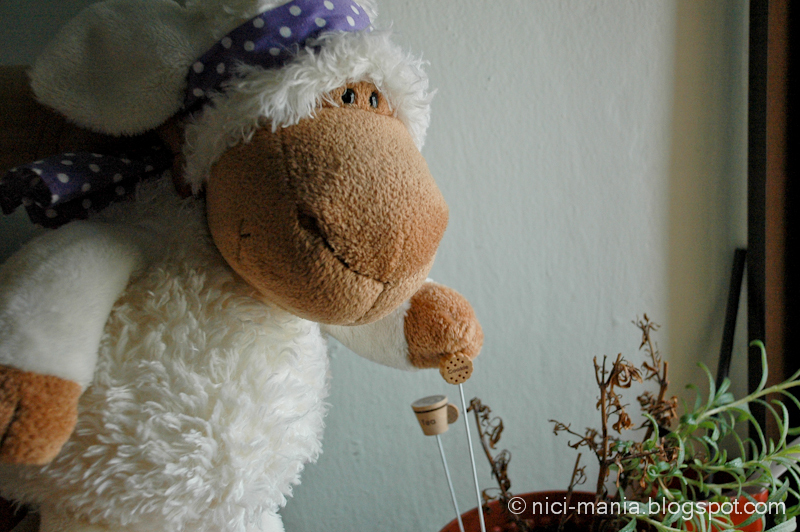 Jolly Liselle is a nici sheep, so it is most perfect for her to give us some 100% natural and pure organic sheep fertilizers. 1..2..3...poop! Liselle, one is not enough. Can you try harder for us? 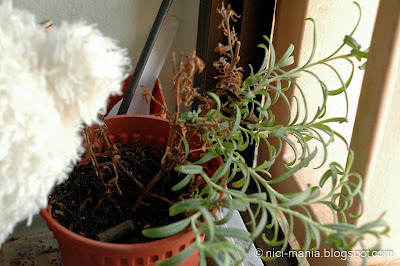 Its definitely not Jolly Liselle's poop on the rosemary plant. 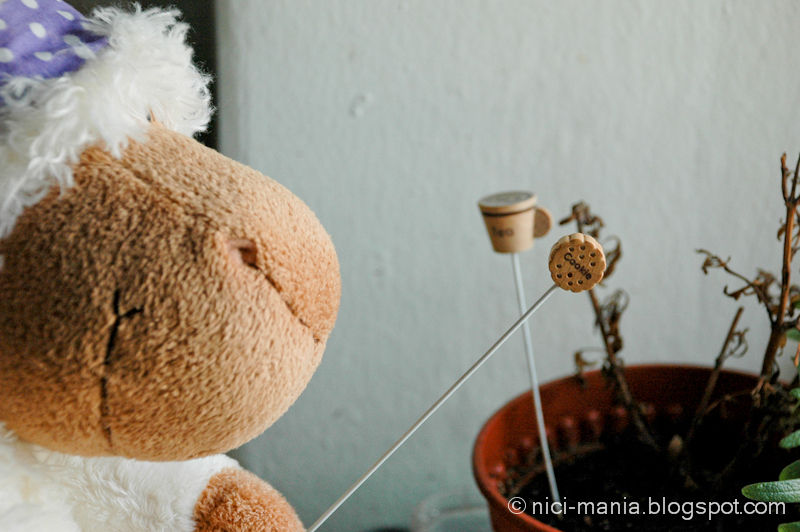 Buy a pack of organic sheep fertilizers which cost $2-4 per pack. These organic sheep fertilizers are great for growing rosemary plants, it is a mandatory investment in rosemary plant care. 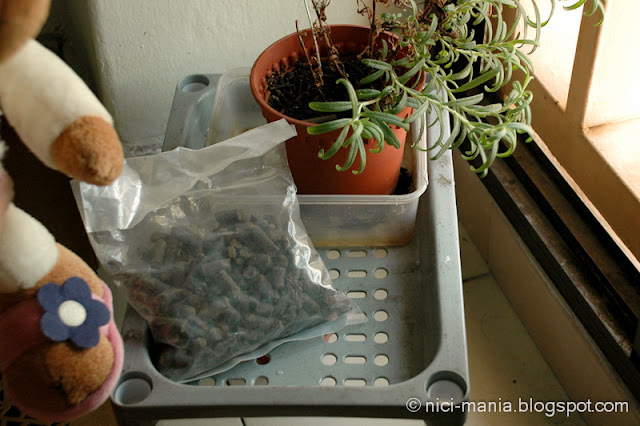 The plus side, these organic sheep fertilizers aren't very costly and you are only required to give it to your plant once every fortnightly (2 weeks) each time ranging from 3 to 10 pieces depending on the size of your plant. In our rosemary case we gave it 3. 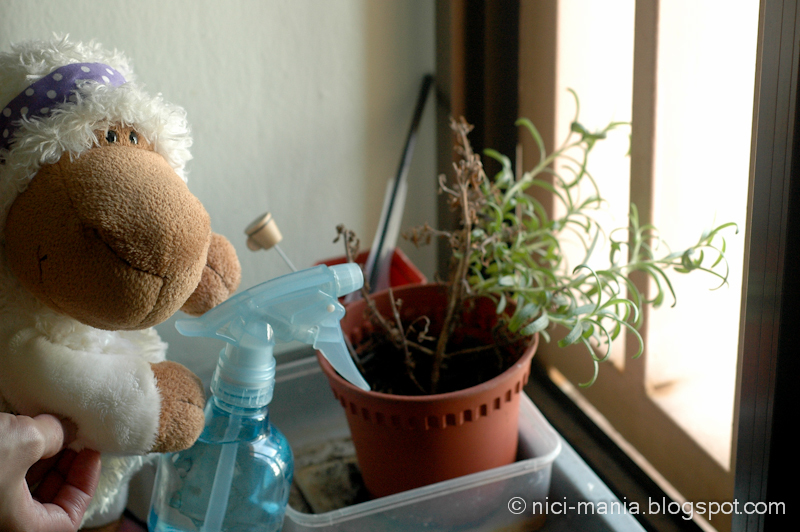 We have a big pot of basil plant and that gets 10 sheep fertilizers. 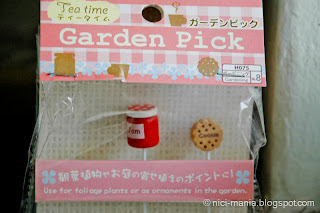 Next, Jolly Liselle adds some soil to cover up the fertilizers nicely. Who wants to play water gun with our nici sheep? Let's put more deco on our rosemary plant! We have jam and cookie here. 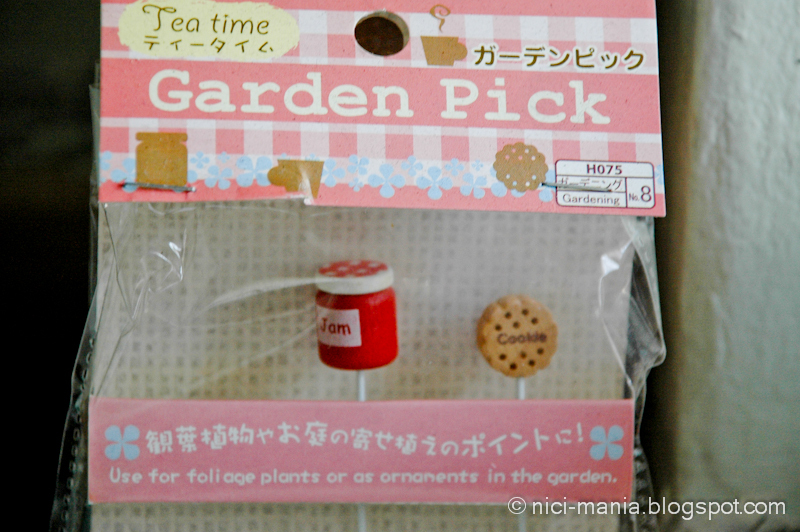 Garden pick selection from Daiso! 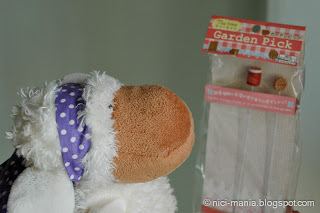 Our favorite source for gardening materials. 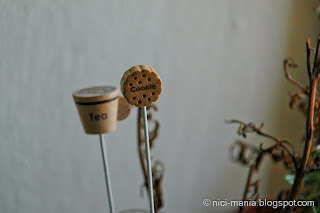 Jolly Liselle picked the cookie to go with the teapot for the rosemary plant. 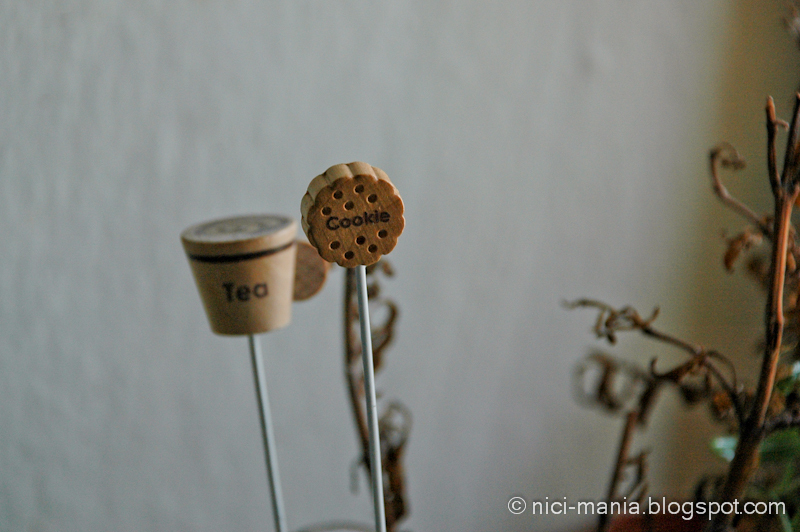 Tea+cookie equates to a nice tea break, its a perfect match in heaven. Terra cotta pots are a good choice for rosemary plants, these pots allow the plant to dry out faster. 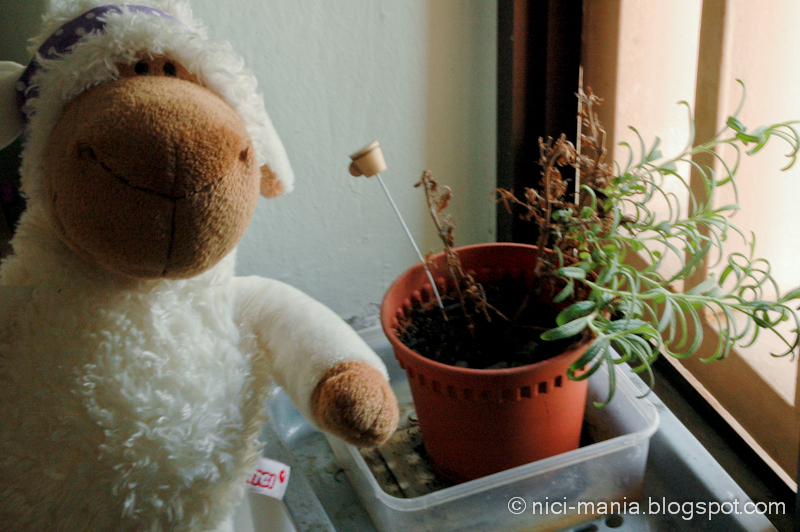 The pot we use here came together with the rosemary plant when we bought it. Rosemary prefers to remain dry, so do not water them like you do with other plants; Water your them delicately with spray bottle when the soil is dry and allow the rosemary plant to dry out between watering intervals. Even indoors, rosemary plants require lots of light, so pick the perfect spot in your house. Trimming rosemary will help make a bushier plant. Herbs love being trimmed every now and then, especially plants like rosemary that is used for flavorings. The general rule for trimming rosemary is not to take more than one-third of the plant at any time and make the cut just above a leaf joint. Same concept applies to basil plant too. 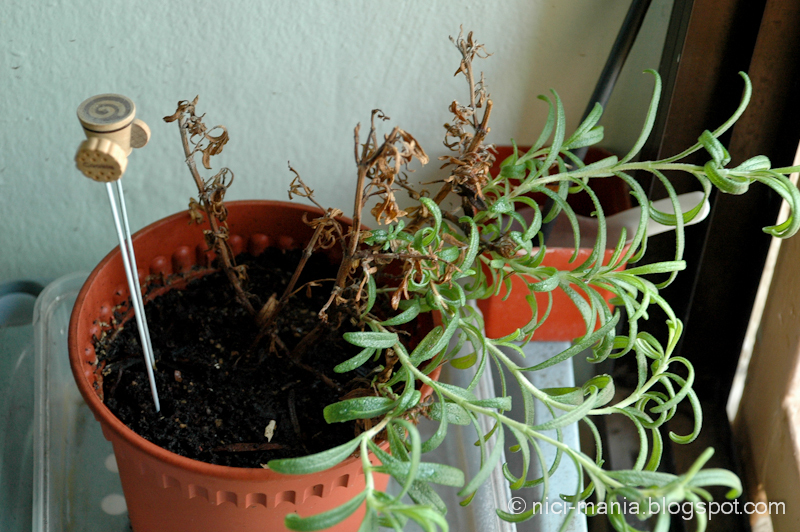 Always use a scissors, do not pluck your rosemary plant. They die if you pluck them, they grow more if you cut them. 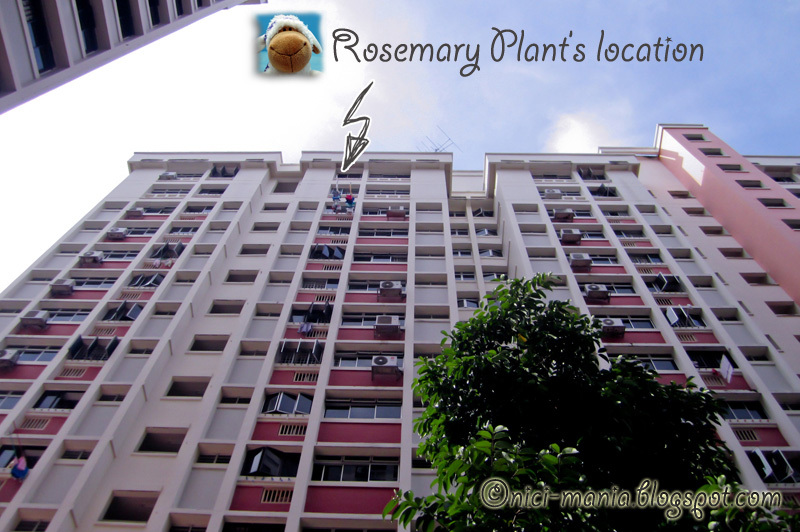 Wonder where our rosemary plant is planted? Hope you enjoyed our growing rosemary plant care edition with Jolly Liselle! She enjoyed it! That pretty plant. I found it funny the last picture haha. 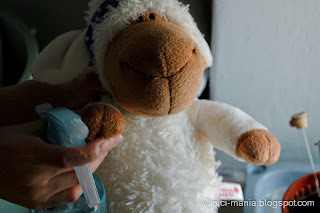 @BeaThanks Bea! We thought the last picture was funny too, which is why it was added to the post last minute. 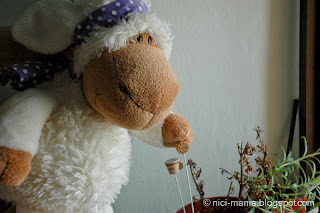 @Leona LöwenherzHello Pauline! Liselle is not a gardener, she's just a busybody sheep haha. We've baked chicken and potatoes with basil leaves before, rosemary with them is a delight too!